Stock Information | Tokai Carbon Co., Ltd. Here you will find general information on shares issued by Tokai Carbon, up-to-date stock figures, and information about major shareholders and share owners. First Section of Tokyo Stock Exchange, Inc.
Notes 1. Tokai Carbon holds 11,789,000 shares of treasury stock but has not been listed among the major shareholders above. 2. The shareholding ratio was calculated excluding treasury stock. 1. Share numbers are rounded down to the nearest 1,000 shares. Our shareholder registry administrators can be contacted free-dial 24 hours a day to change an address, register or change an account for dividend transfer, request forms needed for purchasing shares constituting less than one unit, or request application forms for share inheritance procedures. 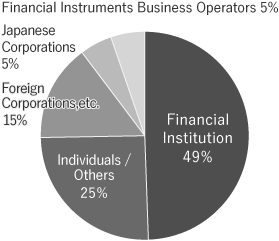 All branches of Mitsubishi UFJ Trust and Banking Corporation nationwide.